My dad doesn’t really like recipes. Well, that’s probably unfair. He likes getting ideas from them, but he really hates following them. I walked into the kitchen this morning to find him peeling a mound of onions. “Ooh, what you making Dad?” I chirped. Chop, chop. Chop. Chop, chop. I consider this a moment. Chop. He nods. Chop, chop. Chop. “The onions were going bad too.” Chop. You’ve got to admire this approach to cooking. Who needs to be tied down by recipes? Why not just throw whatever you’ve got in the house into the pan and see what happens? And, you know, cutting down on food waste is something I always applaud. Unfortunately, I’m much too much of a control freak for that. I’m all for ad-libbing when you don’t have a particular ingredient, but, as with most things in life, I like to start with an end goal in mind. Call me spineless, but I do crave the comfort of some kind of plan before I start chopping a kilo of onions. 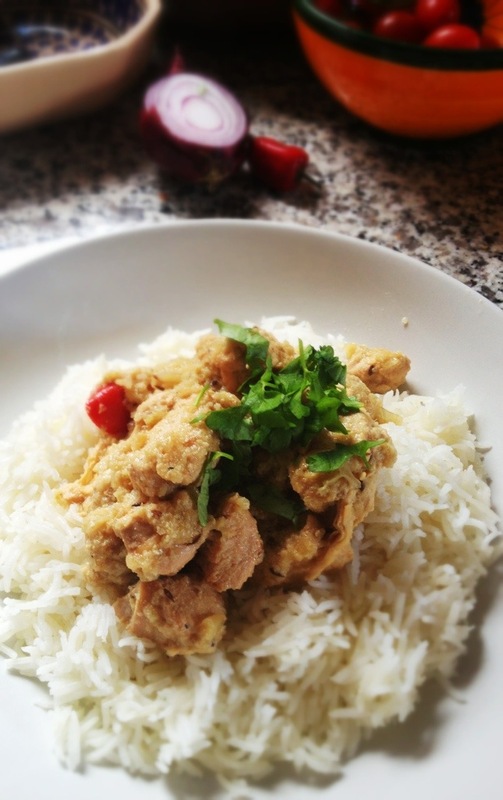 I set about googleing chicken and onion curry recipes immediately. Strangely enough, it turns out that there aren’t loads of recipes calling for those exact proportions. By a twist of fate, there was a library copy of Madhur Jaffrey’s 100 Essential Curries on the kitchen table so I flicked straight to the Eggs and poultry section. Ooh, Hard-boiled Egg Masala (must try this Bengali classic soon)! Aah, Spicy Grilled Chicken! Mmm, Cardamom and Black Pepper Chicken (I really wanted to try this one but, alas, the recipe has no need for even a single onion, so it was ruled out)! And then bingo. There is was. 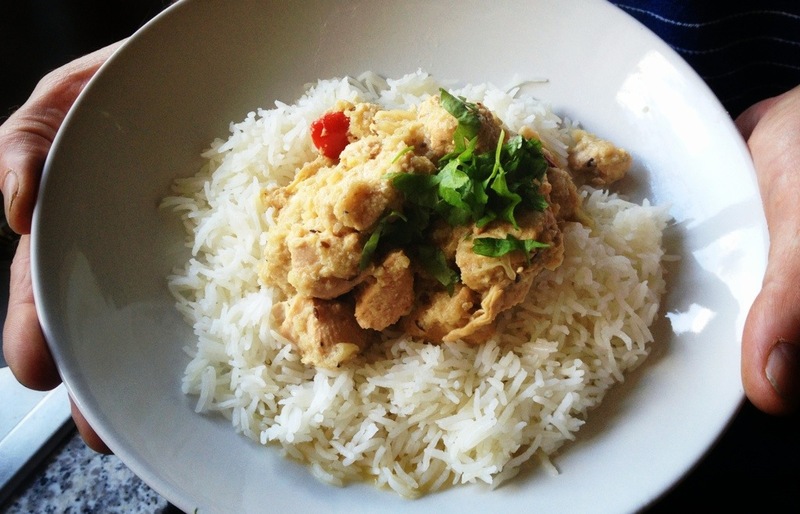 Chicken Rezala. Also known as rizala, this is a Bengali classic I’d eaten in countless homes during my time in Bangladesh. A simple, creamy white and mildly-flavoured curry that requires both quite a bit of onion (not a kilogram, but never mind) and lots of garlic (which my dad had by this time peeled and chopped) – in other words, the answer to our prayers. Madhur’s recipe doesn’t actually call for any whole spices, but I agreed with Dad that it was likely to be a bit bland without. Cumin and cinnamon are curry mainstays, so they went in; the cardamom was simply because my dad seemed attached to it. In my post-cooking research into rezalas (normally something I do before I start chopping the bloody onions) I discovered that cardamom and cinnamon are actually fairly common ingredients, but that was just a lucky whim. This recipe, admittedly random in its origins, was surprisingly delicious. The finished product is deliciously sweet and sour, the sweetness from the added sugar and the tang from the natural yoghurt and citrus juice. 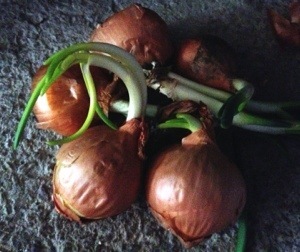 I wouldn’t necessarily put in 10 onions if you don’t have to – I think 5-7 would work equally well – but if you’ve come by an onion glut and don’t want to throw them away, give this a try. Begin by frying the onion rings in 1 tbsp of vegetable oil. You want them to be brown and crisping up by the end (should take about 10 minutes or so). Once cooked, remove from the heat and set aside on a piece of kitchen towel. Now make your paste. Chuck the roughly chopped onions, garlic and ginger into a food processor with 2 tablespoons of water and pulse until they form a smooth paste. Next, heat 1 tablespoon of vegetable oil a wide saucepan, then add the whole spices. Stir gently. As soon as the cumin seeds begin to pop, pour in the onion-ginger-garlic paste. Stir fry altogether until the paste begins to colour. Add the chicken and stir fry for a few minutes until coloured on the outside. Now begin adding the yoghurt, one spoon at a time. Stir in gently, allowing the chicken to continue browning (the point of this is to cook the chicken in the yoghurt, to keep it really tender).Keep adding the yoghurt over a 5 minute window, until it is all added. Now add the browned onions, salt and 100ml water. Bring to a simmer, then reduce the heat to very low, cover and simmer for around 45 minutes, stirring occasionally. Finally, add the chillies, sugar and citrus juice. Stir to mix, then cover and cook for a further 10 minutes before serving piping hot.